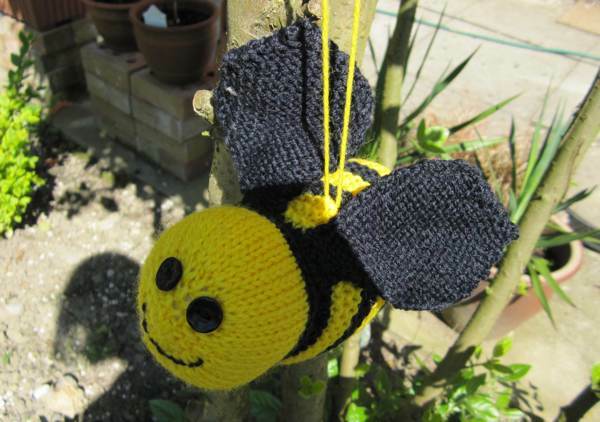 A tutorial has been long overdue, so due to the popularity of Anne’s bees during our recent yarn bombing antics we’ve decided to share the pattern here with you all today! 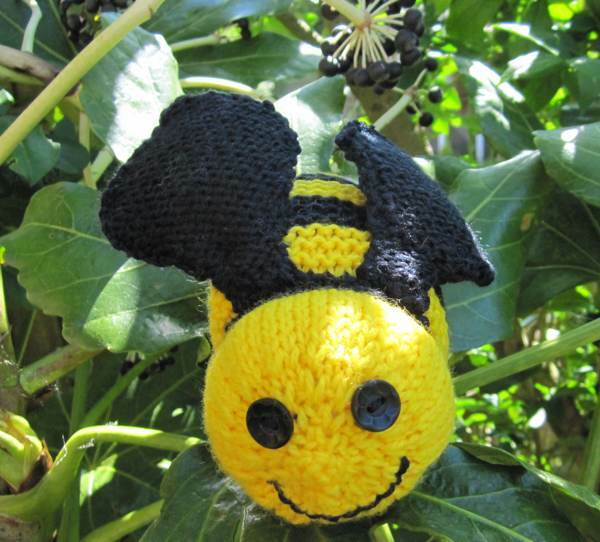 You will need small amounts of double knitting yarn in black and yellow. Cast on 5 stitches in yellow yarn. Row 2 and every alternate row purl. Rows 9, 11, 13, Knit. Row 15 Change to black yarn and knit 6 rows. Row 21 Change back to yellow yarn and knit 6 rows. Row 27 Knit 6 rows in black yarn. Row 33 Knit 6 rows yellow. Row 39 Knit 6 rows black. Row 45 Knit 6 rows yellow. Row 51 Knit 6 rows black. On last 4 stitches knit 6 rows, this will form the sting. Break yarn and thread through the 4 stitches and pull tight. This makes the bees body. Sew along the sting and then sew the body together matching stripes up. Leave a gap in the body to stuff, once stuffed sew gap closed. With a piece of black yarn stitch running stitches around the start of the first black stripe and pull slightly to give the head a little shape. Stitch on two buttons for the eyes and a smiley mouth. You need a small amount of black yarn and size 9 (3.75mm) needles. Knit four wings as each one is made by sewing two pieces together. Row 6 and each alternate row is purl. Rows 17, 19, 21 knit. Rows 23, continue in one row knit one row purl and decrease one stitch at each end of every row until you have 10 stitches. Sew two wing pieces together wrong side facing outwards. When both wings wre complete sew them to the back of the bee behind the head. 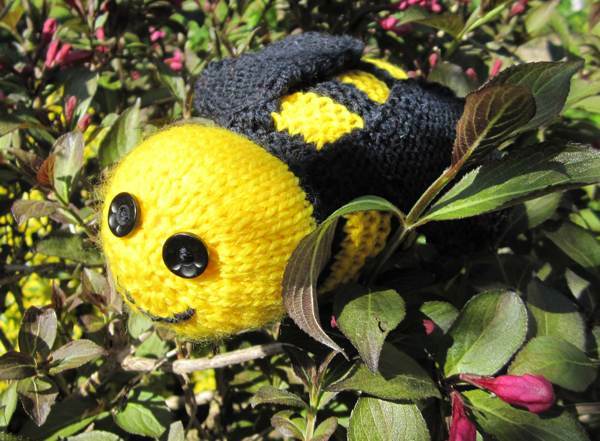 This entry was posted in Tutorials and tagged bee, bee pattern, bee tutorial, craft, knit, knitted, pattern, tutorial, yarn bomb, yarn bombing. Bookmark the permalink.